I'm sure glad I made a second trip to the Quimby Street Lucky Lab's Barleywine Festival Saturday night. At least half of the beers were already gone by that time, but I did discover one very pleasant surprise. Beer Valley's Highway to Ale was one I passed over on Friday afternoon, because I didn't care for the Beer Valley brews at last year's Fresh Hop Tastival. But I gave it a whirl Saturday evening, and decided that Highway to Ale was my favorite of the barleywine festival -- the perfect mix of dense malt, tasty hops, and firewater. When Dave and I showed up at lunchtime Friday, some of the beers I was eager to sample weren't yet on, including Oakshire Sasquatch, Ft. George XVI Chapel (a favorite from last year), and Three Creeks 8 Second. Friday was a beautiful sunny day and the warehouse door at the Lucky Lab was thrown wide open, lowering the temperature to about 40 degrees. Dave had to put his hat and mittens back on. Sunny days in the spring are a time of ecstatic disorientation for Portlanders -- it's as if we've arrived in Valhalla and all rules are suspended. Let's open the doors and windows, we won't get cold! Stop sign, what stop sign? No kidding: on my way to the Lucky Lab, I watched motorists at two intersections drive right through stop signs at full speed. It's just the sun, friends, it's not an archangel come to take you home. Here are my Not-A-Wine-Guy™ descriptions of my favorite beers from the festival. Remember, some of them are just "big beers" and not technically barleywines. I got the merest taste of the Three Creeks 8 Second -- it was hooked up just as I was leaving Friday -- but it seemed promising. Dark and hoppy, maybe a little dry? There were a slew of beers that I missed completely, mostly because they came and went between my visits. Hmm... Charles also came and went between my visits. I wonder if he drank up all the beer I wanted to try. Saturday I did get to try the lovely Oakshire Sasquatch -- not to be confused with Bigfoot -- one of several batches of the late Glen Falconer's strong ale recipe brewed around the state in his honor. The Ninkasi version at the Barleywine Fest was also quite tasty, and last week at the Green Dragon our friend Corey brought some deliciously malty and yeasty dry-hopped Sasquatch he brewed at the Cornelius Pass Roadhouse. But my three Sasquatch sightings can't compare to the five Sasquatches Angelo tried a few weeks ago. I feel like an old stumblefoot for not even getting my hands on the Hopworks Sasquatch yet. There were some surprising breweries missing this year: no Caldera, no Rogue, no Full Sail? The delicious Caldera imperial stout has been a perennial favorite of mine at this festival. And the only thing Deschutes could come up with was a keg of 2005 Mirror Mirror that hasn't aged gracefully? The Deschutes brewers in the Pearl should have landed with both feet on a barleywine festival in their own backyard. Despite those omissions, the Barleywine Festival was a great success. Timing is everything, though. Next year I'll try to get there before the kegs run dry, but after they've actually been tapped. Was it really cold in there? Oh, I actually read the whole thing - I guess it was cold in there. Glad I didn't go then... I'm much more concerned about the ambiance than the barleywine. Matt: Charles liked the 05 Tavern Rat also, I wish I'd tried it. Jill: It was a double whammy -- the barleywine and Dave's ears were both too cold. Best not to ask how Bill was able to compare the temperature of my ears with the barley wine...I'll be keeping my hat on around him until the memories fade. The stand-outs for me were the Walking Men and the Lagunitas Gnarly Wine. 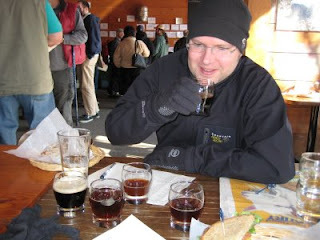 The Knucklehead '07 (non-barrel-aged) was so far gone that even Bill didn't want to finish it--a first? The barrel-aging either masked the badness or it was better cared for.